136 pages | 4 B/W Illus. At the core of The Relationship Factor in Safety Leadership are eight beliefs about human nature that are common to leaders who successfully communicate that safety is important while meeting business results. Using stories and business language the book explains how to create and recover important stakeholder relationships by setting priorities and taking action based on these beliefs. The beliefs are based on the author’s 25 years of experience supporting operational and safety leaders with successful and unsuccessful change efforts in nuclear, mining, manufacturing and power generation in multiple countries. The author also offers compelling evidence from many social and scientific disciplines that support the conclusion that satisfying our need for relationship is a major motivator. The book provides managers and supervisors with the motivation to build relationships and points to the mindset leaders need to succeed with the Five Orientations to Conversation Model. Going beyond communication techniques it offers a perspective on solving complex problems when confronted with multiple demands. It addresses how our state of mind influences our ability to listen, gather data, interpret it, and lead a group through implementation with clarity and flexibility. The book is written for managers and leaders, at all levels, concerned with occupational health and safety, and wishing to learn how to leverage relationships to achieve higher employee engagement and performance. "For too many years, safety management has put nearly all of its effort into attempts to control and/or "fix" employee behavior. As a result, many companies are drowning under a sea of rules, cardinal rules, over complicated procedures and high-dollar behavior modification schemes. The result is a prohibitively expensive and overly complex workplace where getting anything done, including safety, is far too difficult. Worse, serious incidents and fatalities are actually on the rise in many countries, including the US. In the Relationship Factor in Safety Leadership Ms. Carrillo has given us a far more productive and sustainable path forward; one that views employees as resources rather than liabilities. Using real life stories and examples Ms. Carrillo makes the case that it’s not our workers that need fixing; it’s our antiquated command and control approaches to leadership. She intelligently and convincingly argues that, rather than piling more and more controls on our workforce, we are better served by building relationships and partnerships with our workers that drive organizational excellence. As Ms. Carrillo states in her Eight Beliefs of Relationship Leadership' "people are able and willing to contribute to the success of the enterprise." I can attest from personal experience to the truth of this statement and I think Ms. Carrillo’s provocative new book will convince you as well. 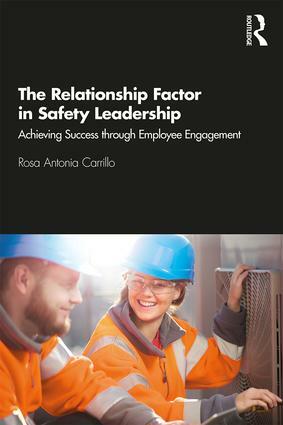 Although her book is aimed at safety leadership, her compelling lessons on the importance of building worker relationships, based on trust and respect, are universal. Smart companies increasingly realize that employees aren’t a problem to be controlled but a willing resource for solutions and continuous improvement. Anyone interested in the benefits of an engaged workforce committed to driving organizational excellence will greatly benefit from reading this book." — Jim Loud CSP MS MPH, Independent consultant and author with 40 years of corporate management experience with large commercial nuclear power utilities and Los Alamos National Laboratory. Rosa Antonia Carrillo, president of Carrillo and Associates, is an internationally recognized leader in creating transformational change with a focus on the safety, environment, and health function. Since 1995 she has authored and consulted in many countries on the topic of safety leadership to governmental and corporate clients in Mining, Pharmaceutical, Utilities, Nuclear, and Aerospace.